Fix engine problems by trusting Wayne's Auto Repair for comprehensive engine repair in Powell, OH. If you have vexing vehicle problems, allow us to identify and repair the issue. You need a reliable car or truck, so bring it to our auto shop for engine service. 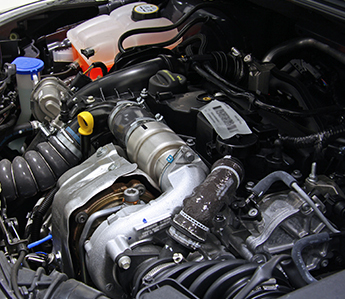 Our ASE technicians perform everything from engine tune-ups to repair and replacements. Having more than 40 years of experience in the industry, we know how to make sure your car runs smoothly again. Stop by our shop, and we'll provide a diagnostic and a quote if it needs repair work. Do You Need Engine Replacement? You'll find that our mechanics excel at performing reliable auto repairs. However, there comes a time when repairing your vehicle's engine is simply not a cost-effective solution. So, if you love your car, consider engine replacement. We replace all types of engines for cars and trucks. Allow our skilled technicians to help you decide if this is the best choice for you. By providing engine replacement, we extend the life of your vehicle for many more years and miles. Improve the operating efficiency of your engine with engine tune-ups. Similar to oil changes, tune-ups ensure your car is in good health. This service also allows us to see if there are potential problems with your car. We provide auto diagnostics and tune-ups for all makes and models. From replacing spark plugs to inspecting hoses and other important engine parts, we give your car a complete checkup. In providing this service, we make sure your car remains in smooth-operating condition. If your car's engine is stalling or sputtering, bring it in for a diagnostic today. Contact us to schedule an engine diagnostic if your check engine light is on. We proudly serve customers in Powell, Lewis Center, Delaware, and Dublin, Ohio.